360 DEGREE VIEWS OF MOUNTAINS AND THE OCEAN!!! MINUTES TO THE BEACH!!! 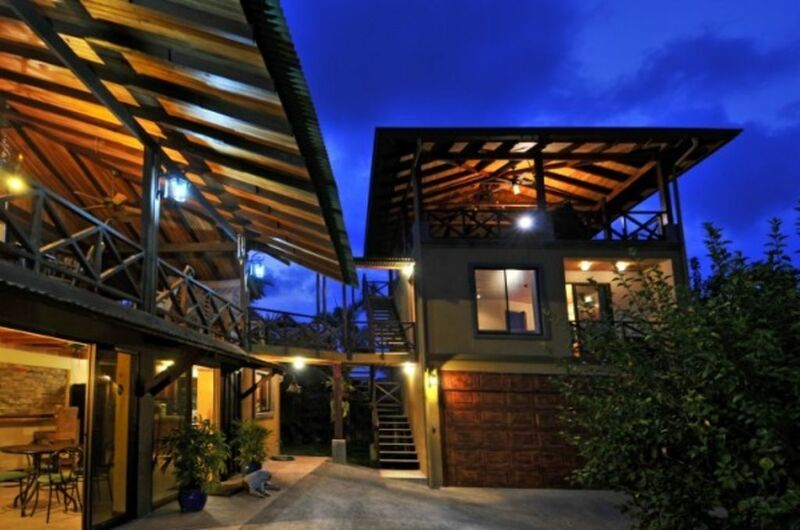 Spacious and well appointed, The Hilltop House In Esterillos Oeste, Just a 20 minute drive to Jaco, is fast becoming one of the most sought after Costa Rica vacation houses within the beachfront village of Esterillos Oeste. During your stay at The Hilltop, you will likely receive daily visits from scarlet macaws and possible some toucans, as well as a myriad of other wildlife including white face monkeys. The property is set in a quiet and safe area and offers a multitude of outdoor living spaces, including a 3rd floor observation deck and lounging area. Relax in a hammock, enjoy the pool, or perhaps a cool drink up on the beautiful 2nd floor indoor / outdoor entertaining deck. In addition, The Hilltop In Esterillos includes a private, fully appointed 2nd floor suite with quaint kitchen, living room with ocean and jungle views, separate bedroom, and a full bath. A quick drive or short walk down the hill and great surf, quiet beaches, tide pools, local shops, bars, and food awaits. Less than 30 minutes from Jaco / Los Suenos or Manuel Antonio. ***PLEASE MAKE SURE YOU CHECK OUT OUR VIDEO AT THE END OF THE PHOTOS!!! PURA VIDA!!! Beach is beautiful, at Lowtide there are tidepools to wade into and find shells and fish. At high tide the beach is wonderful for swimming. Safe beach for kids, he waves are not too big and lifeguard. Esterillos is a quiet little town with lots of fishing, swimming and snorkeling, and wonderful things to do as well as fantastic restaurants with American and Costa Rican food alike. See the ocean and the white water waves breaking right from the property, as this property is a three minute walk from the beach but also has beautiful views of the ocean, sunrise and sunset. Amazing views of the Misty Mountains in the distance, you can see the fog lifting over the mountains and the birds every morning. 360° panoramic view of the ocean, mountains in jungle, as well as the jungle below. See Toucans, macaws, monkeys and other wildlife every day. Walk right to the beach, and walk home with no problems. Two ways to the beach, take the short road or the long road.. either way you will be happy. 8 mb Free WiFi for high-speed wireless Internet throughout the entire house! 8 MB Free Wi-Fi throughout the entire property! 6 burner stove with oven, complete kitchen for culinary enjoyment. Totally Equipped with dishes, utensils, coffee maker, etc. Dining in main area, sits 8, sits 6 upper deck, and 4 in the second kitchen area. This property is up on a hill and has several stairs to access. However there are 2 bedrooms on the the main level. Pool is exquisite, nice and deep but with the shallow end for kids and a small pool on the other side. Great property for family and friends. We stayed at hilltop house for 8 nights celebrating a birthday with a group of 7 of our friends and family. The house was great at accommodating privacy as well as having multiple larger areas to commune. The 360 degree view 3rd story was great for enjoying sunrises and sunsets. With the naked eye we watched capuchin monkeys come out at dusk and dawn in a tree not far from the property. The pool was the perfect size for everyone to cool off and our 4 year old son to jump in and swim around. We cooked quite a bit and the kitchen had every pot, pan, and utensil we needed to use multiple burners at once. The separate apartment is great for a family traveling with a young child as it has its own kitchen as well as a crib and extra pullout bed. We had a vehicle to get around as the hike down (and up) the hill is not far but challenging — especially in the sun! In town there are a couple of stores that met most of our needs. There are also some great restaurants as well as a fried chicken window. Yocseliny, the manager of the property, was very helpful and prompt at answering questions we had. It was an amazing vacation in a quiet town with some really nice people. Thank you Josh! I am very happy you had a good time with your family and friends. Come back soon!! This house was perfect for our family. We loved our stay. Best family vacation we have ever had!! My husband and I stayed here with our 12 and 9 year old children as well as our best friends and their 5 year old son and newborn baby and nanny. This house was perfect for a multi-family vacation. We all had our own private spaces! The property is absolutely stunning with beautiful tropical landscaping, macaws, monkeys, iguanas and even a sweet coatimundi! It was an easy drive to Jaco Beach for surf lessons, to Quepos to meet our whitewater rafting guide and to the famous Hermosa Beach! The owners was so helpful in helping us arrange for horseback riding, fly fishing, ziplining, chefs, surf lessons, a monkey farm tour, whitewater rafting and restaurant recommendations. The gated property is fantastic! The owners literally own the hill and the homes sit at the top of the hill with a gorgeous 3rd floor terrace overlooking the jungle AND with a view of the ocean. We did so many amazing things on the 6 days we were there but certainly a highlight was have massage therapists come to the house and give us couples massages on the beautiful upper deck of the main house during a powerful rainstorm. My children said that it is by far the most incredible place they have ever gone and we go a lot of places! I can't say enough wonderful things about this property, the owners, the property manager and the experience in general. It was truly a magical vacation! Hello Nina. Thank you for staying in Hilltop House Esterillos. It was a pleasure having you as guests! I hope you will be back soon! We had a great week here with our extended family. There were plenty of beautiful spaces to gather or to be alone. A highlight was birdwatching on the top deck. The neighborhood was quiet and the town was very relaxed. The nearby beach was good for boogeyboarding and surfing. A great house and a great vacation. Thank you Nancy. It was a pleasure to have you and your family staying in the property! The place is fantastic. We were 7 adults and 4 children in this big house and each was able to settle down comfortably and have his intimacy. The apartement above the garage is brilliant. The swimming pool is maintained well and we were surprise that there is not or very few insects (ants or others) in the house. The sea is not too far, we can go on foot there but it is necessary to expect to climb a good hill on the way back. No negative point except that a clothesline would have been very appreciated. We recommend strongly the rent of this house. N.B. : You must be very careful with a small child because he could be able to pass trough the banister of balconies and find himself on the roof or downright on the ground. Other Activities: surfing, adventure tours, crocodile tors, canopy tours, ATV tours, horseback tours, and so much more. Also take a boat out for the day or half-day to go fishing with the locals. Catch mahi, Dorado or even tuna.